Christmas 1984 was one holiday that will forever live in my memory. Not only did my parents have the Killer WHALE sitting under the tree that morning, but they also made certain that my fledgling Cobra army was not forgotten. Sure, the Joes got a nifty hovercraft with enough firepower to lay waste to several small towns and had a huge mobility advantage over the tiny terrorist army. (Remember, I grew up in Central Illinois—we’ve got small towns in abundance.) 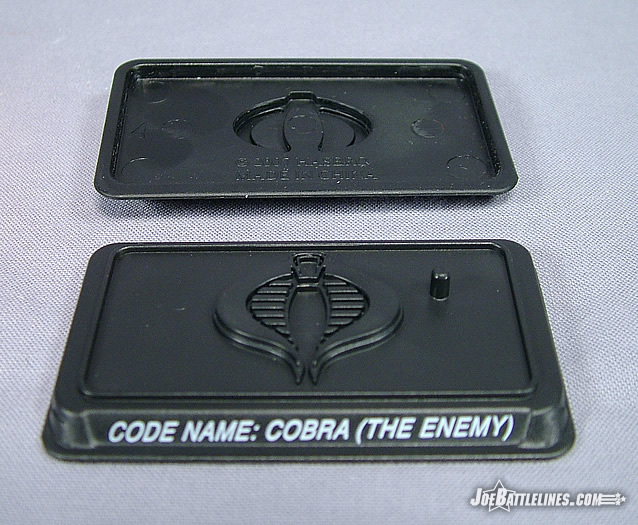 However, a box from the Sears catalog containing Destro, Firefly, Scrap-Iron, Storm Shadow, and Cobra’ spremiere femme fatale ensured that my Joe figures never under-estimated Cobra ever again. (Oddly enough, this set retailed for only $19.99!) Always a strong presence in the cartoon and comic series, the Baroness was a character that I never thought would see release and yet there she was; ready to take on the entire Joe roster armed with her trusty rifle and backpack. Now, the Baroness takes her place in the 25 th Anniversary roster in a brand new form. However, after reading this review she might have wished she stayed in 1984. 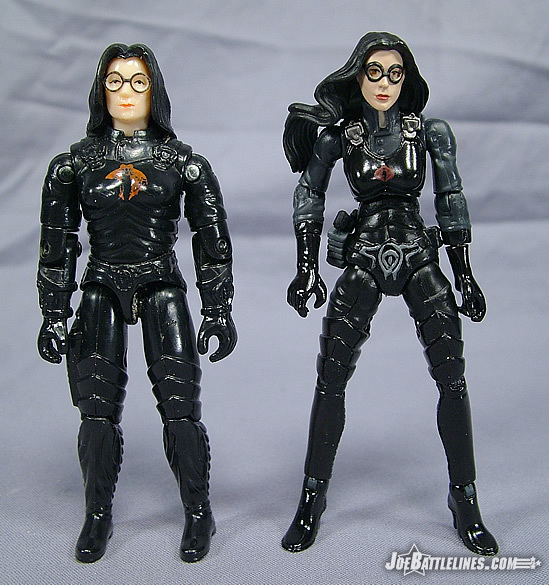 As with all of the figures in this series, Hasbro went back to the premiere (and only) version of the Baroness from the GIJoe: A Real American Hero line. Anastasia DeCobray is presented here in her classic black leather costume that has left Cobra Troopers minding their gaze in Destro’s presence for two-and-a-half decades. This figure is actually quite well done in terms of character design as Hasbro opted to actually add a bit more detail than was found in the original figure. 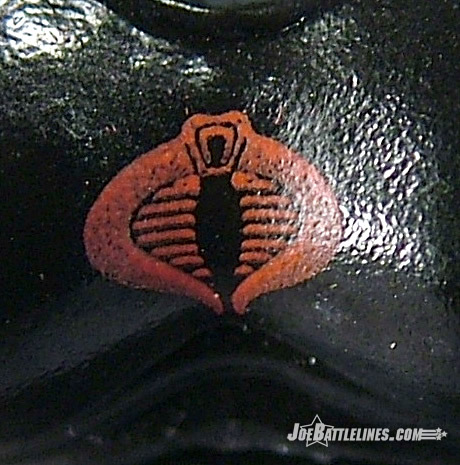 Originally molded entirely in black, this anniversary edition actually sports a two-tone uniform. The Baroness’ breast plate, hips, boots and gloves are black but the high-collared tunic worn under the chest armor is actually a dark charcoal hue. The result breaks up the sculpting nicely while still maintaining a level of design cohesion. 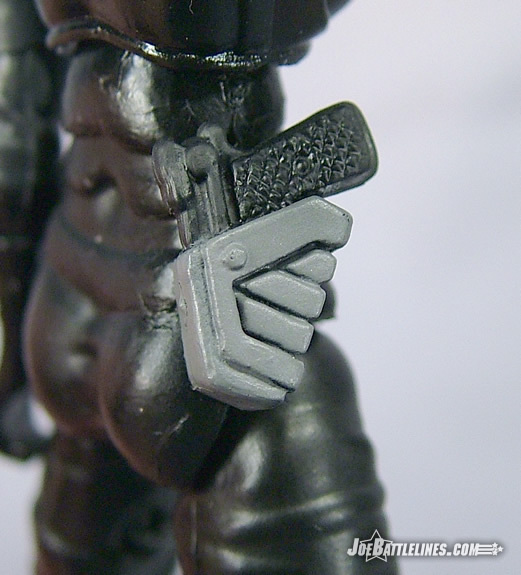 This multi-layered effect also carries over to the sculpting as well; the “fabric” portions of her uniform have sculpted folds while the more rigid textures are entirely smooth. Add in some silver highlights for the buckles on her breast plate straps and a diminutive Cobra sigil and Anastasia is ready to take her place as the head of Cobra Intelligence. There is even an attached holstered pistol (non-removable) on her right hip—further adding to her sense of deadly grace. 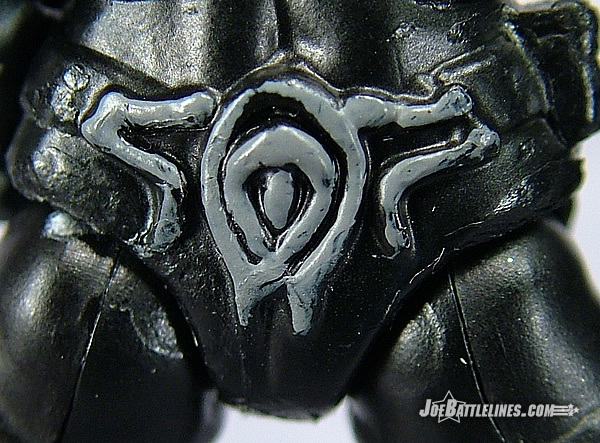 Her belt buckle is also highlighted with a much lighter coat of gray but the paint applications on mine are actually quite sloppy. (See the close-up to see exactly what I mean. The application is far sloppier than I’ve seen even in GvC.) Still, the sculpt maintains the classic elements of the original design yet takes them in a decidedly more feminine direction and, as such, succeeds in capturing the essence of Anastasia. Much like Duke, Scarlett, and Roadblock the head sculpt used for this figure borrows far more from the animated continuity of GIJoe than it does the comic canon. The face is elongated with soft edges and the proportions are ever so slightly exaggerated, giving the visage a decidedly cartoon effect. 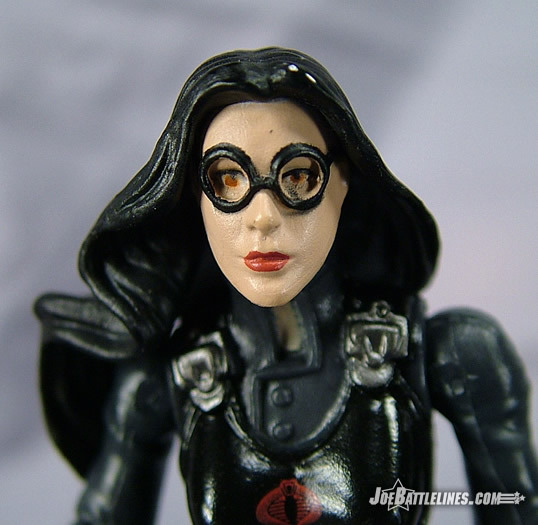 The Baroness’ glasses are molded on and covered with an application of black paint and her flesh tones appear to be painted on as well. In true femme fatale fashion, she sporting a particularly bright shade of crimson lipstick and her brown eyes are visible through the “lenses” of her spectacles. In keeping with the Comic Pack version of Cover Girl, the figure’s hair is molded in a windswept pattern which looks quite dramatic in some poses. However the active nature of the design means that her hair will look out of place in some settings. I can see dio-story authors eventually throwing in various asides about “where’s the draft?” I am rather surprised that the figure appears to have brown eyes; I’d simply assumed that someone like the Baroness would be possessed of a more exotic eye color. Overall this is a decent head sculpt for Anastasia although I would have preferred a more comic-accurate take on Cobra’s premiere intelligence officer. 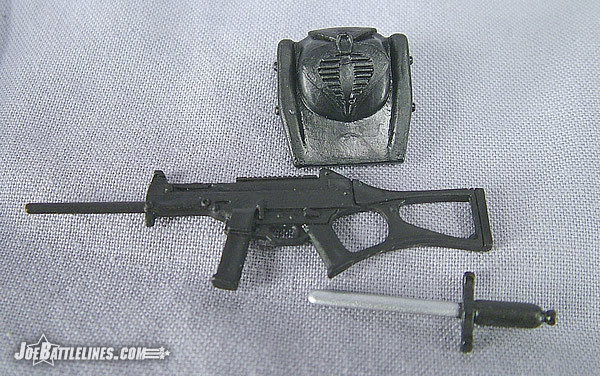 The Baroness is equipped with the requisite faction base and reprinted file card as well as a knife (the same as came with the Cobra Trooper), back pack and rifle. If the rifle seems familiar it is because it was first seen with the Valor vs. Venom wave 7 Bombstrike figure. It would seem that Hasbro is trying to make use of existing molds where possible as this is the second larger weapon to have been reissued in this series. Wow—where to begin. 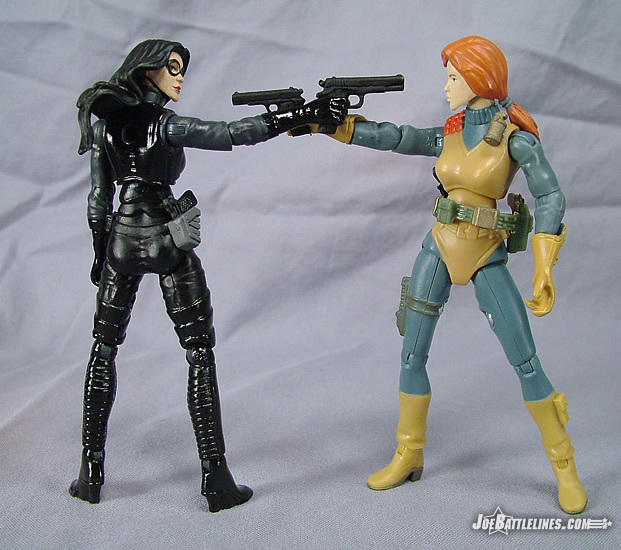 If you’ve ready my half of the “preview” of Scarlett over at GeneralsJoes.com, then you know that I’m really not a fan of the articulation (or lack thereof) found in the figure of the GIJoe counter-intelligence agent. I thought that Scarlett was pretty much the articulation low point of the entire anniversary series—until I opened the Baroness. In terms of upper body movement, the Baroness isn’t all that bad. She’s got the standard 25h Anniversary points of articulation (ball shoulders, swivel and hinged elbows, rotating wrists, ball neck, and mid-torso joint) and, in spite of the flimsy nature of the figure, she moves fairly well. Her arms are extremely think when compared to some of the “boys in the line” and the softer plastic used in her forearms and hands feels quite fragile when compared to the harder materials used in the GvC era and the even harder plastic used in ARAH. My figure has difficulty holding her pistol or her rifle in her right hand and yet the smaller knife seems to work just fine. 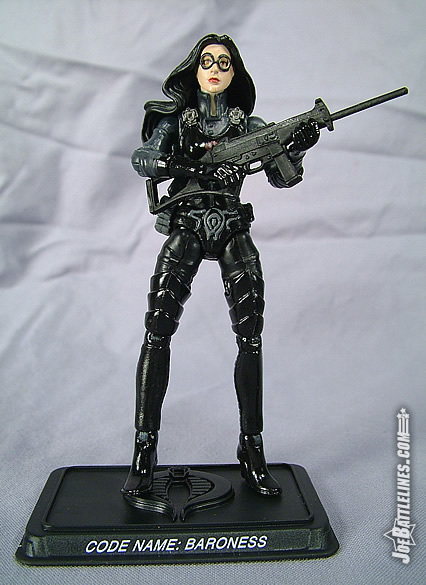 However, it’s not the softer materials that make the Baroness the worst figure of the line thus far. It is her complete and utter inability to raise her legs straight up that renders her nothing more than “standing eye candy”. Whereas Scarlett could sit—albeit in a completely improper posture—the Baroness does nothing so much as flop down on the ground spread-eagled. That’s right—the high class spy mistress cannot assume even the most remotely dignified position in a chair and is completely incapable of fitting in any sort of vehicle other than a motorcycle. Plain and simple, her legs cannot move up but instead only turn out and to the side. Now, I’ve complained about limited articulation in other figures in this line but this really borders on completely and utterly inexcusable. Again, I’ve heard people say that she can be fixed by grinding away at her pelvis with a Dremel rotary tool or even a file. My response to that is: why? Why should I have to take a brand new action figure right out of the package and immediately take it to the work bench to fix glaringly obvious design flaws? This is sloppy design, plain and simple and not something that I would expect from Hasbro. 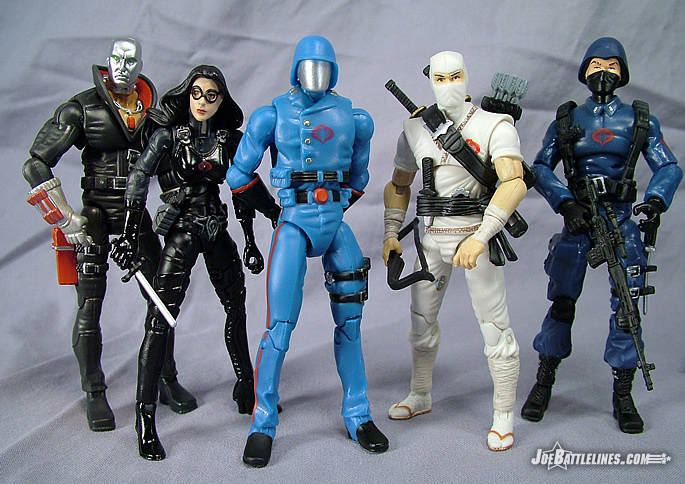 It’s not like GIJoe in this size is a brand new concept and it’s not like they haven’t had 25 years of a proven construction to base new designs on. Worse yet, it’s not as if she’s the only female figure in the line. Even Scarlett, with her limited mobility, can still achieve a far wider range of positions than this waste of plastic. So, when comes to the Baroness, consider the ball completely and utterly dropped. She’s able to stand on her flimsy ankles somewhat—(the softest plastic in the legs is found in the calves which makes NO sense at all) but try and move to anything other than a “Charlie’s Angels” pose and you’ll thoroughly disappointed. I’ll be blunt—aside from looking nice from a distance this figure is utter garbage. 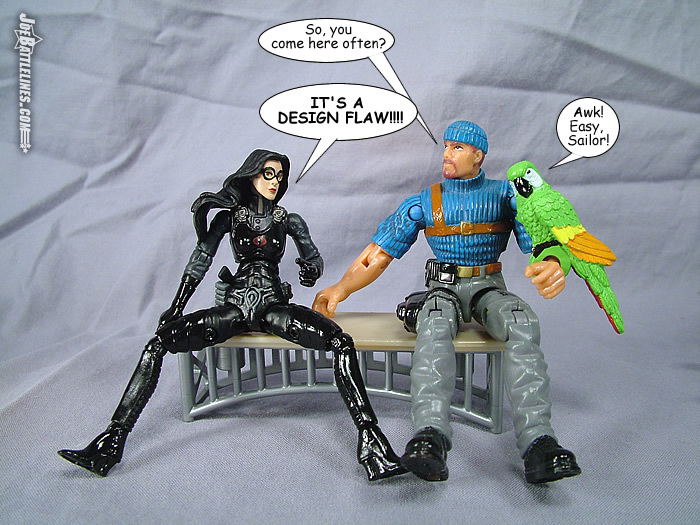 I have never believed in the concept of “form over function” and, up until now, neither has the GIJoe line. 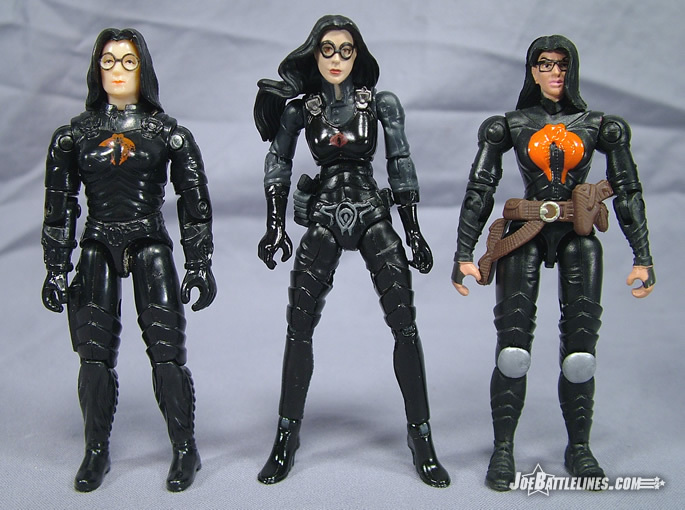 Joes have always been poseable and well-sculpted and even some of the most awkward early designs from the GvC era maintained a full range of mobility. This figure, however, might as well have been designed by McFarlane toys for all of the useful motion she possesses. Notice in most pictures you find of the Baroness that her legs are almost always in the same position. The reason for this is that it’s about the only stance she can achieve and hold for any length of time. 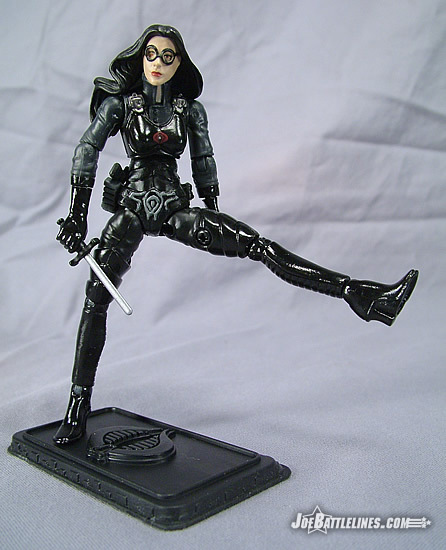 Honestly, I’ll take ANY other version of the Baroness over this one and am quite disappointed that this figure EVER made it into production. Hasbro is capable of so much more.